Today it snowed!! The girls were SO excited! I had a doctor appointment at 11 this morning, so they were at mom's when it started. 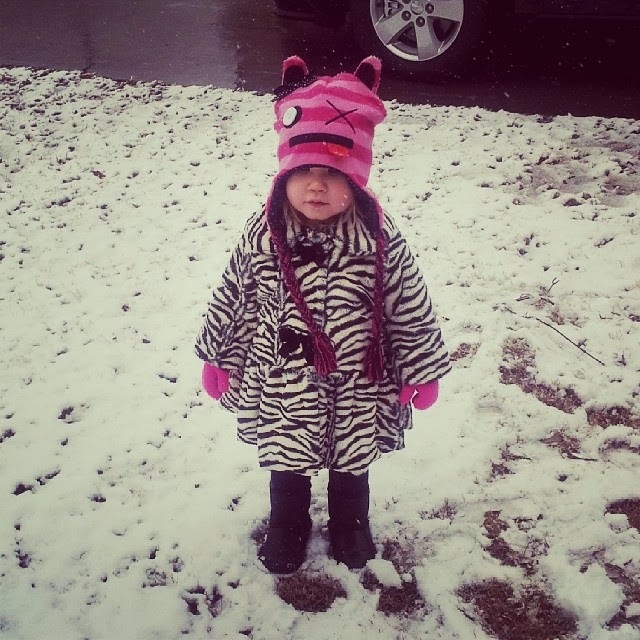 The second flurries started, Madelynn called me ecstatic that "everything was going to be white!" and asking when she could go play. It didn't take long before the ground was covered and the second I walked in the door to bring them home, they were both begging to go out and play in it. Annabella kept pointing out the window saying, "No, No. See no?" 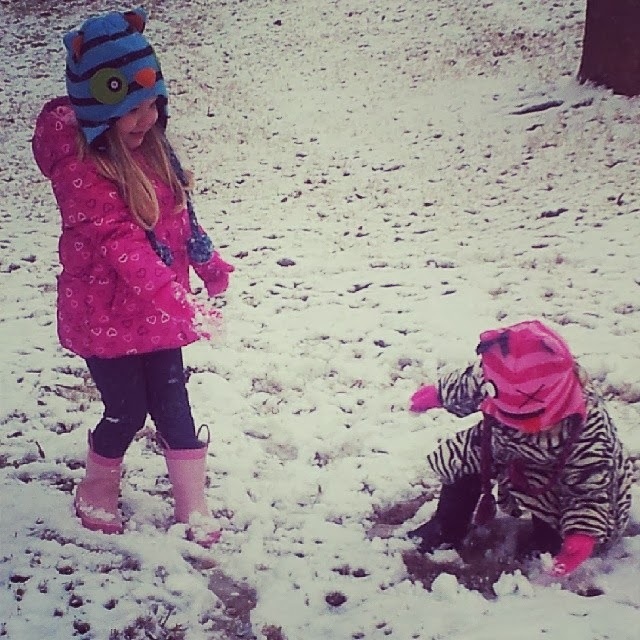 This was Annabella's first snow and the first snow that Madelynn can remember. Watching their excited faces and seeing them experience it for the first time was precious. Once Jonathan got home from work (which was several hours early, of course), we bundled up the girls and took them out. The neighbors were out, so they all got to play together. 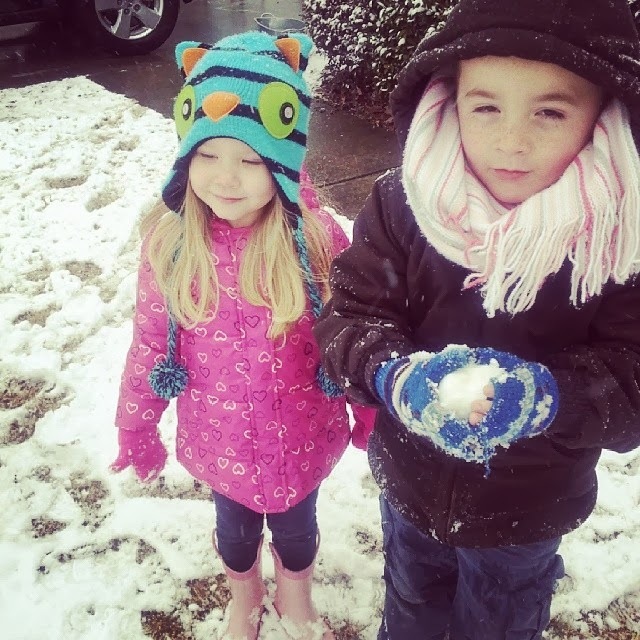 They learned how to make and throw snowballs and just how much fun making designs in the snow with sticks was. They played on their bikes and ran as fast as they could. It was so adorable. After a little while, Annabella was announcing that she was "told", so we packed it up and came inside for a family dinner and a warm fire in the fireplace. It was such a fun and unexpected day. On a different note, today is my due date with Noah! I'm 40 weeks pregnant and more than ready to meet my little man. I've made a little more progress, but the doctor discussed with me that he doesn't want me going over 41 weeks and that Noah appears to be a pretty big baby. Annabella was 8lb, 9oz so I'm hoping he's not much bigger than that. We decided to induce him this Saturday. I could still go into labor at any time, so he just might be born in January. Otherwise, we're looking at a February 1st birthday. Only 4 more days!!! I'm entering week 39 of my pregnancy with Noah and as anxious as I am to meet my precious son, I have to remind myself that life as we know it is about to drastically change. These are the last few days that we will be a family of four. Our lives won't revolve around just two precious little girls, but a little boy as well. 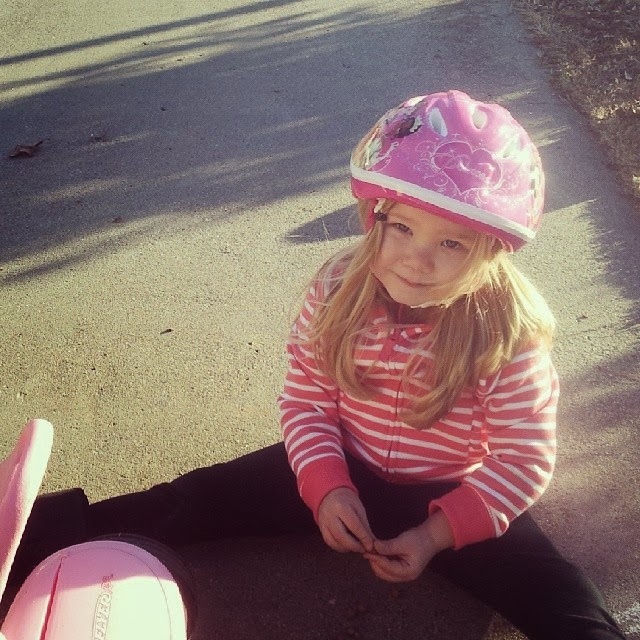 Annabella will no longer be "the baby" and Madelynn will assume the role of big sister to two little ones. 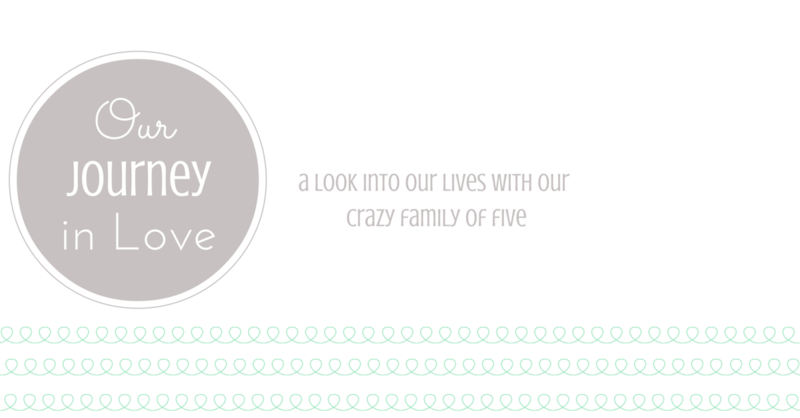 My attention will be split between three children who need my all and we'll have to reprogram how we live, being a new family of FIVE. Nothing will ever be the same again. And while that's okay and I'm so excited to embrace our new lives, I'm finding myself soaking up every single second of what I have now. What I've known for the last two years. 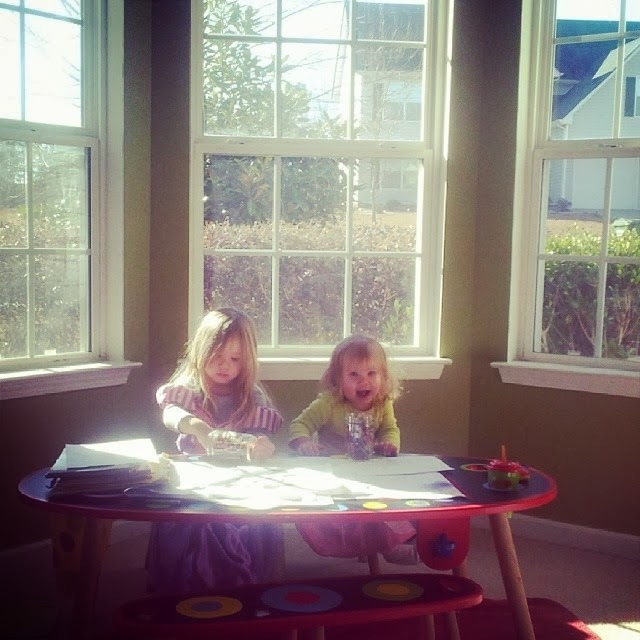 These two precious faces that are growing up faster than I can stand. I remember how scared I was when Annabella was born. I was induced the day after Easter and I cried almost all day long on Easter because that was Madelynn's last day as the only child. 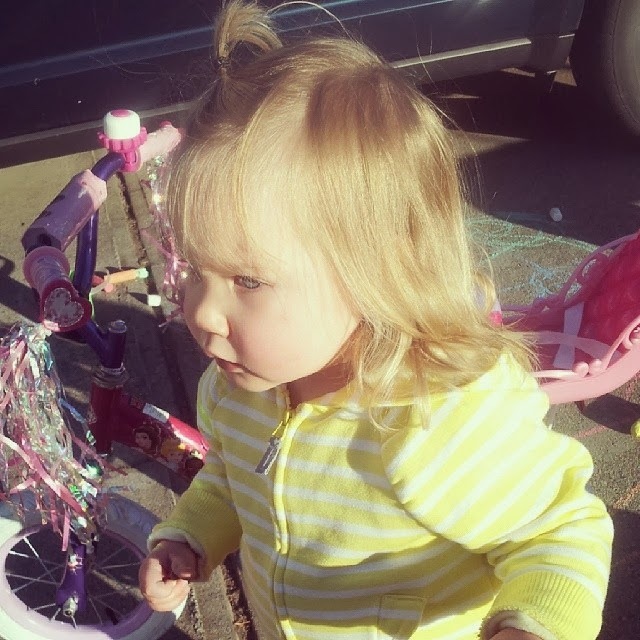 She was too young to understand what was going on and I was so afraid she was going to feel sad and left out. Of course she adjusted better than I ever expected and she became a fantastic big sister. This time I'm not quite as worried about how they're going to adjust because they're such sweet and loving little girls. Noah is going to think he has three mommies with as much love as they're going to give him. What's better than a real life baby doll?! So I head into this new journey with no idea what life will be like with three children, but so absolutely excited and thrilled to see what God has in store for us. In the mean time I'm going to spoil, hug, love, and cuddle with my little girls. We are anxiously awaiting the arrival of baby Noah. His official due date is January 28 which is only 12 short days away. With the exception of a few tiny details, his nursery is complete and I am so excited to share it! I had an extremely small budget to work with now that we are a soon-to-be family of five on one income, so I had to be extra creative with the details of this room. 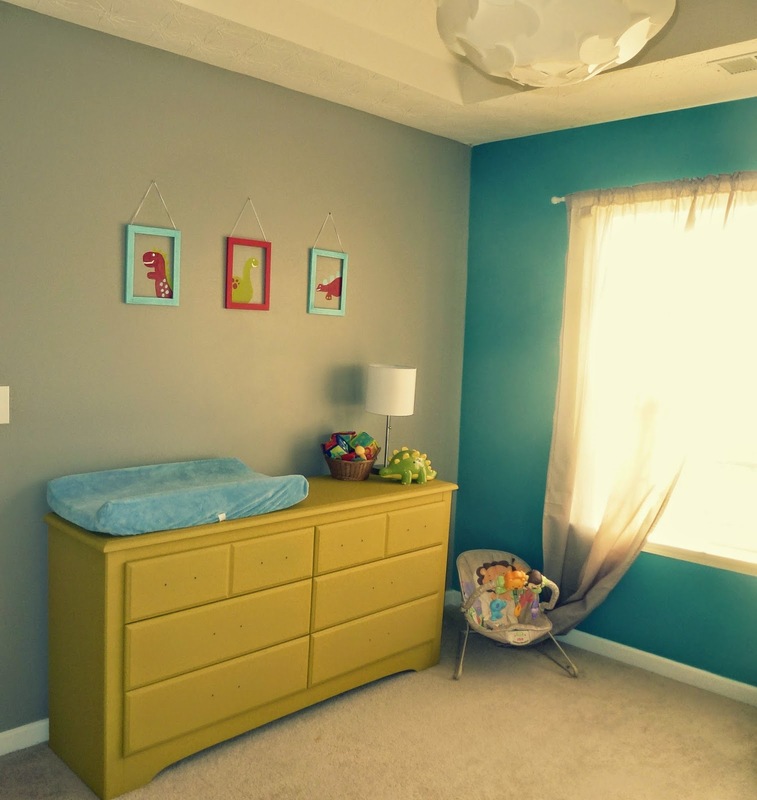 Our goal was a tranquil nursery with an underlying dinosaur theme. The colors on the wall are colors that he can grow into and his crib will convert to a full size bed, so he's set for the next few years. I'll also do a budget breakdown as I go. This is the view from his door. We kept the existing light fixture from when this was first used as Madelynn's nursery. The wall color is a gray Behr oops color from Home Depot ($8) and the accent wall is a pretty jewel tone blue ($12/quart). 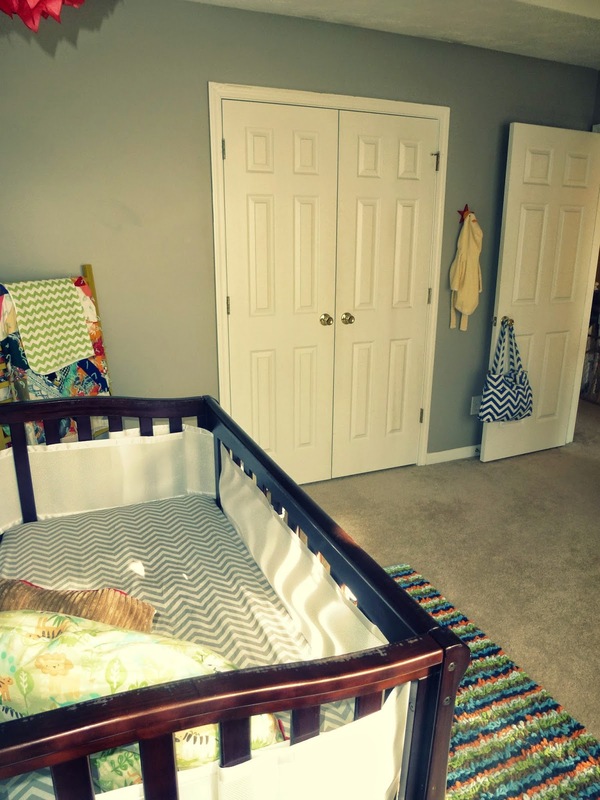 His crib is a second hand crib that I found online and we only paid $60. Like I said before, it will convert all the way to a full sized bed and it was in great condition. All I needed to do was slightly sand and restain some spots that had been chewed on from the previous occupier and then I gave it a good cleaning. There were a few scuff marks on the wood, so I used a magic eraser to go over those marks and it looks good as new. The stain was around $8 and we have a TON left for other projects around the house. We purchased the chair for Madelynn's nursery and this is the third nursery that we've used it in. It's from Ikea and is so comfortable for late night feedings and rocking. The quilt rack in the corner is the drop side off of Madelynn and Annabella's old crib. I was clicking through Pinterest when I came across the pin and thought it would be such a sweet way to keep a piece of furniture that was so important to me, but now useless. I was also able to display a quilt that my great grandmother hand made, while adding a trendy chevron receiving blanket to keep it looking modern. I painted it with the paint that we used for the dresser that you'll see on the other side of the room. The mobile is tissue paper poofs that were from Annabella's first birthday and the letters are from Joann's ($6). I painted them with paint I already had and a $0.50 jar of oops sample paint from Home Depot. I received the rug as a baby shower gift. 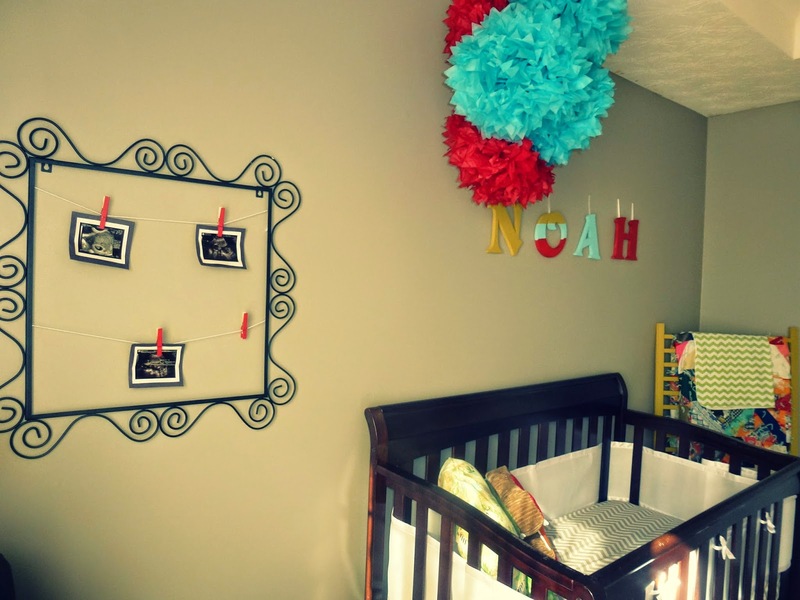 Don't be afraid to add decorative nursery items on your registry! I have never been a fan of changing tables. They're so temporary and rarely stylish with no storage, so this time I decided to use a dresser. That way we have extra hidden storage and it's a piece of furniture that he can continue to use as he gets bigger and out of diapers. Plus, it gave me the opportunity to make it a one of a kind piece for him with a bright, fun paint color. I still have to repaint and install the hardware on the drawers, so ignore that it has no pulls. The dresser was a second hand piece that we found online for $50 and repainted. The paint cost $12. The entire piece is in excellent condition and didn't even need to be sanded before I painted it. The changing pad, changing pad cover, and bouncer were Madelynn and Annabella's as well. 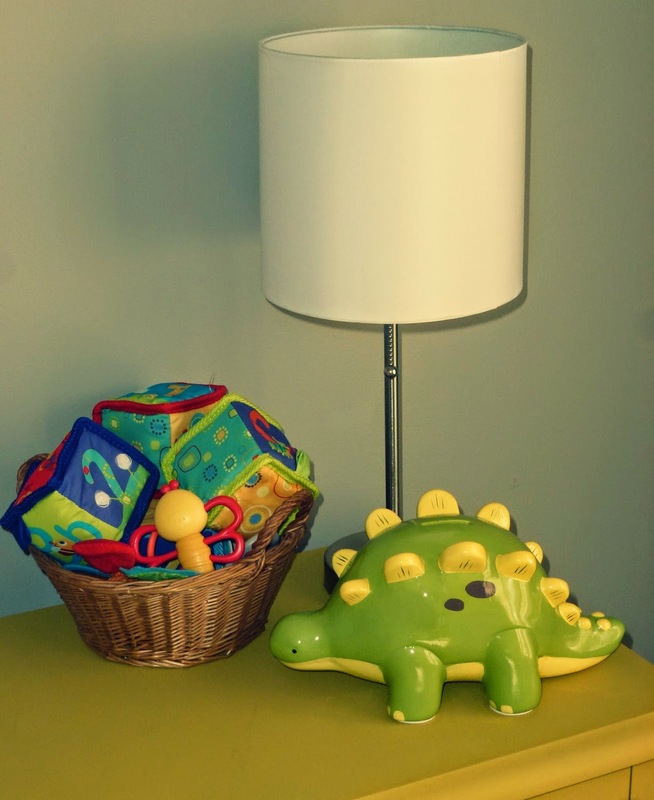 The dinosaur bank and lamp came from Target. We used gift cards that we received as baby gifts to buy those. The basket is one I already had and I filled it with soft toys and teething rings that the girls had when they were little. 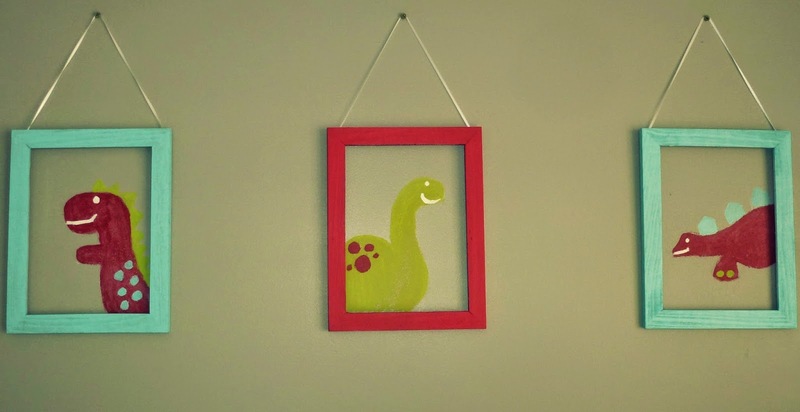 As for the art work, I free handed the dinosaurs right onto the wall. I already had the three unpainted wooden frames that didn't have any glass or a backer, so I painted them and hot glued ribbon on the backs to hang them, just like the letters over his bed. The drapes are a light khaki color and came from Ikea ($10/pair). We already had the curtain rod. The black frame on the wall above the chair was a mirror from Ikea that had broken. Art work can get expensive, so during my search in the house for something to fill that space, I came across it and got creative. I popped the glass out and I hot glued yarn across the front of it in two places. Then I painted clothes pins red to hang pictures and artwork from. For now, his ultrasound pictures are hanging, but we can add more clothes pins so we can hang pictures of him and artwork for him by the girls. Here is a closer shot of my homemade art. 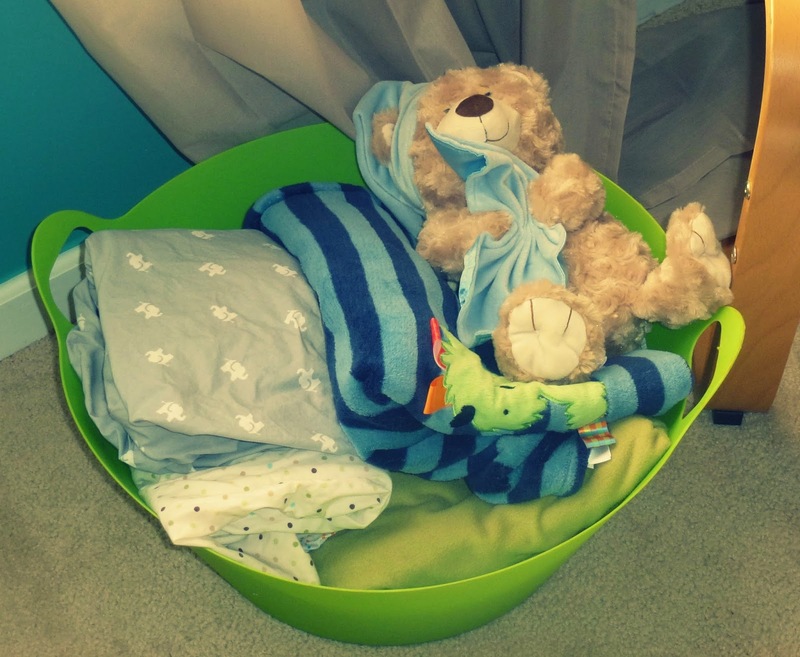 I already had the green bin that's sitting on the floor next to the chair and it's holding more blankets, extra sheets, and a snuggly teddy bear. This is the inside of the crib. 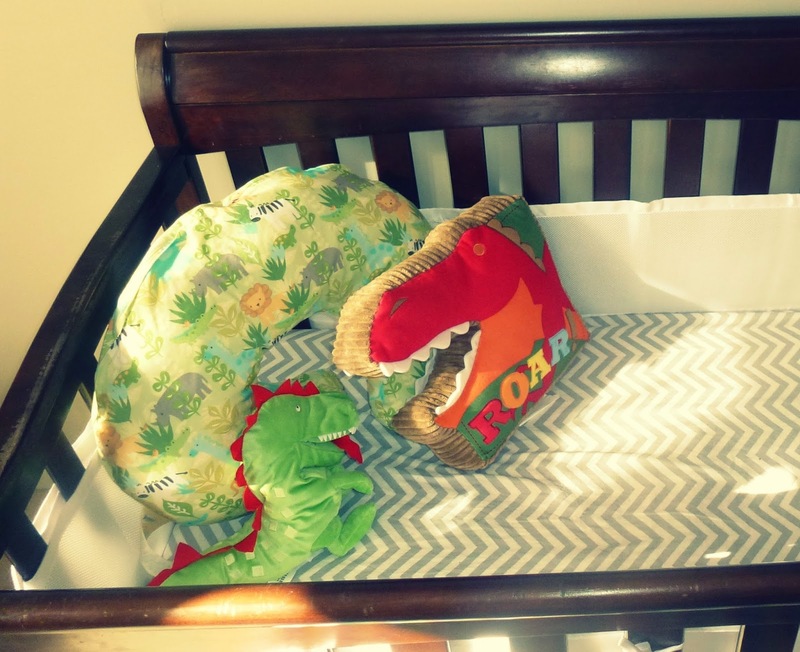 The sheet, mesh crib bumper, and big dinosaur pillow were baby shower gifts. The Boppy is the original one we got for Madelynn and the smaller dinosaur is a puppet we bought from Ikea ($8). You can also see how great of shape the crib is in from this angle. If we bought this brand new, it would have been $200, so I'm pretty proud of this find. In case you're wondering, we didn't get the used mattress that was being sold with the bed, we used the mattress we already had. I don't recommend buying used mattresses. Just so you get the full view of the room, this is the view from the chair in the corner. 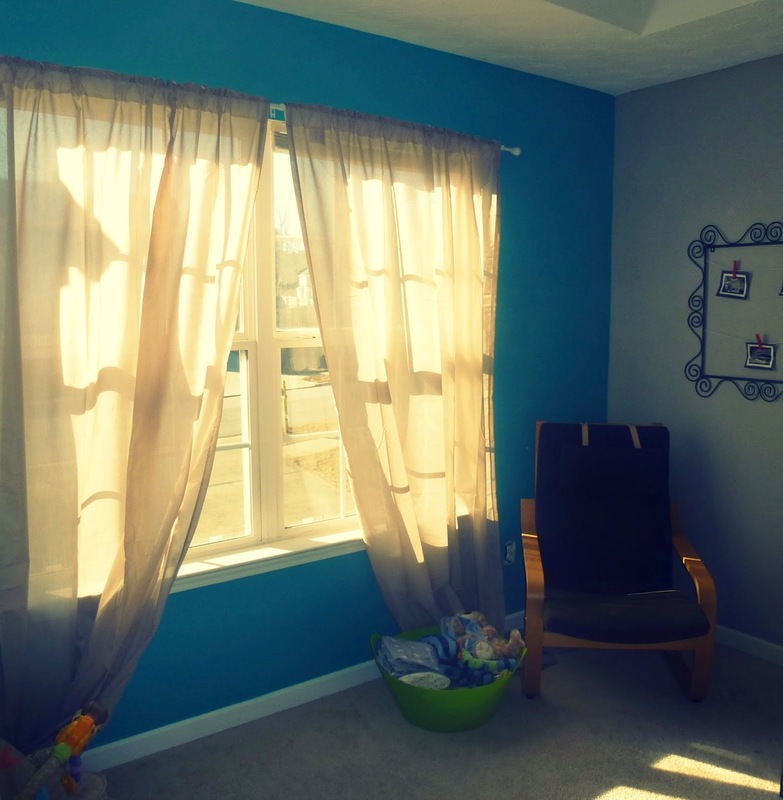 The star hanger to the right of the closet doors is from Madelynn's nursery. I painted it from pink to red and hung his robe on it. That's his packed diaper bag hanging on the door knob, ready to go to the hospital when he decides to make his arrival. I still want to make some more art to hang on the walls, hang another star hanger near the dresser to hang his outfits from, and finish the pulls for the dresser. All in all, we spent a total of $174.50 of our money in this room. (That's not including the little bit of money we used in gift cards.) 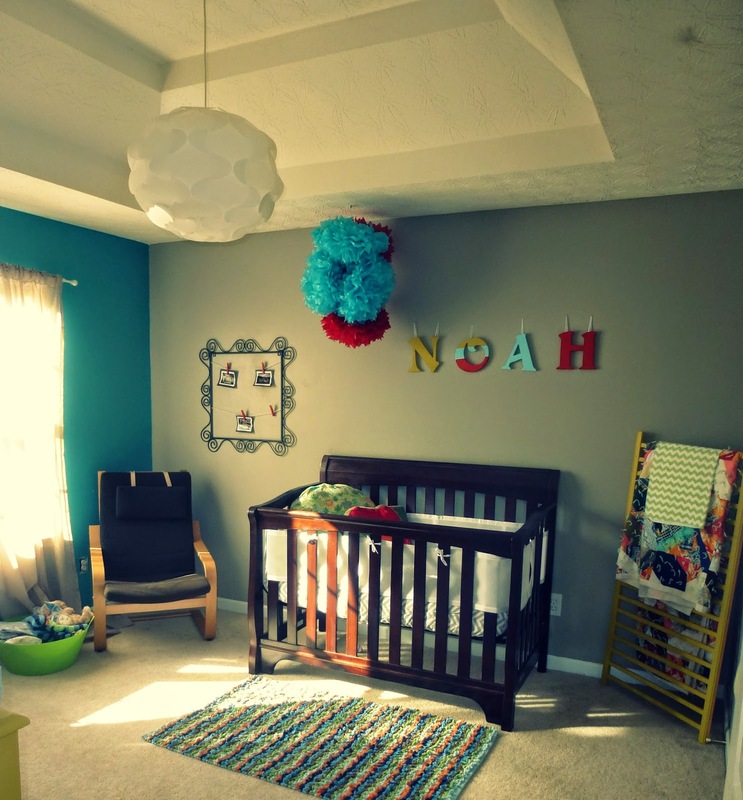 By buying second hand, using items we already had, utilizing Ikea, baby shower gifts, and putting a lot of creative effort into it, we have a beautiful nursery that's ready to welcome our precious little boy. The best part to me is that it has so many sentimental pieces from when the girls were babies and the quilt from my great grandmother. I can not wait for this little boy to hurry up and get here already!! Get the latest sent directly to your e-mail!